You all know what a doting wife I am, so of course I pulled myself up by my bootstraps and got the job done. My good friend Cara (who will be partially responsible for any damaged relationships due to this gift) was kind enough to help me with–okay, do most of–the work. She is a true canning/cooking whiz and shared some of her talent with me (thank you, Cara!) Will any of the three people reading this blog think less of me if I tell you that this is the first thing I have ever canned? Ever. I’ve done freezer jam, but the art of canning has eluded me. Until now. 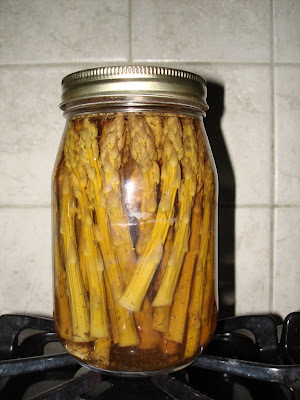 The pickled asparagus has given me a shot of heartburn, I mean, confidence, that has me excited to try canning some peaches in August. But don’t worry. We won’t burden you at Christmastime with sweet, juicy peaches. We know your family is dying for a bite of Derrick’s Special Garlic and Jalapeno Asparagus. We’ll keep the peaches for ourselves. Happy Holidays! Um, I’m about to lose all credibility here, but…I’ve actually never tried the pickled asparagus. Not one bite. Some things are best learned about secondhand. Um, did YOU enjoy the garlic jalepeno asparagus as well? If we lived closer, I hope I’d be on the pickled Christmas list so I could give this treat a try! Love your writing, Jen! Glad to see you are blogging. We love to hear Derrick’s and your stories! How fun to hear from you! Yes, you are a definitely a relative of sorts, like it or not! And the so-called “Christmas List” of friends we give gifts to? Really, really short (kind of like our list of friends!=) But I know you’re dying for some asparagus, so I’ll be sure to insulate a box and send you some for Christmas! We loved seeing you guys too. I need to check out your blog! Your family could not be cuter. I’ve never heard asparagus described more aptly. You definitely have a way with words. I’ll sneak some peaches to you at Christmas when Derrick’s not looking. We did ten cans; more than enough for me! And yes, Cara is an absolute gem–love that gal! And thank you for not canning, either–it feels good to hear that from an overachiever like yourself. Thank you for your comment! What a treat. A friend (or relative) of Don and Lisa’s is a friend (possibly relative?) of mine. Your comment cracked me up–at first I thought I was going to get a bunch of advice on canning. How refreshing to hear you tell me not to stress it. Love it! Hope to hear more from you! Um I really love you guys and I’ve always considered myself to be a relative of some sort. I would just like to officially say that I’m TOTALLY ok with never having been on your Christmas gift list! lol Your blog is cute. Hope we can keep in touch a little better, I’ve missed you guys. It was so great to see you in November in Oregon. Hi Jennifer I am Donald’s mom, Susan. I used to can peaches and pears and my children LOVED them. So much in fact that it would take maybe two weeks for them to demolish probably 10 hours of work (minimum.) After several years of that I finally got smart. That is code for I HAVE NEVER CANNED A SINGLE BOTTLE OF ANYTHING EVER AGAIN. OK, so how many jars of this garlic-jalapeno-pickled asparagus did you can yesterday? So ambitious! And that Cara – she is a gem, isn’t she? And for the record….I have NEVER canned an item. Not once. Not ever. Do you think they’ll boot me out of the R.S?? I am not against peaches for Christmas. And I have heard that once you hit 35, your taste buds start to diminish rapidly…therefore explaining Derek’s acquired taste of those putrid sounding sticks. I on the other hand still have a solid 4 years of working taste buds, which explains why the peaches are a better choice.